Perfect For: Day Drinking Outdoor/Patio Situation Sports! When plans for a second location of the classic Upper East Side burger joint J.G. Melon were announced in late 2014, people had mixed reactions. Much like when a classic movie starts production on a sequel decades after the original, excitement was met with a great deal of skepticism. You can't just re-apply a formula for success with a completely different cast and crew and expect magic to happen. You'll end up with Dumb and Dumber: When Harry Met Lloyd. Then again, maybe you can. Because as far as we can tell, the new J.G. Melon is an excellent copy of the first. 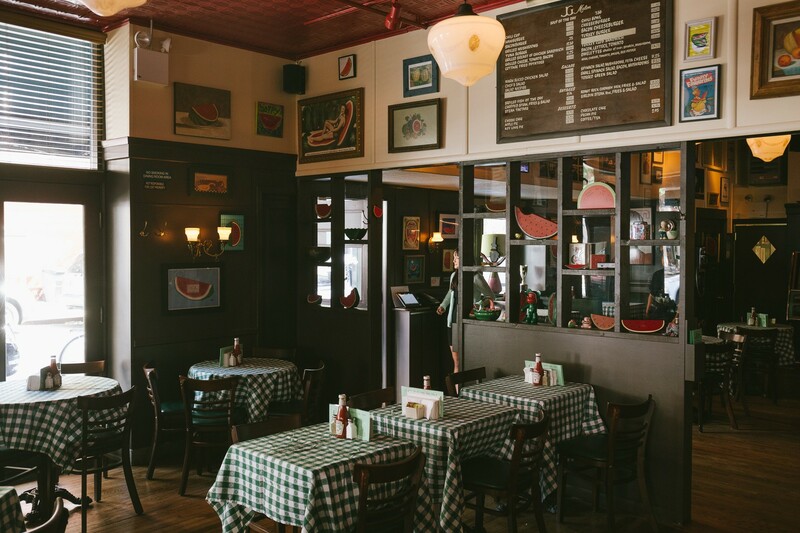 The new spot on MacDougal Street is run by a few seasoned restaurateurs and one longtime manager of the original who licensed both the name and the watermelon trinkets from the 3rd Avenue location. Actually, they seem to have also licensed every other detail, from the burger recipe to the cottage fries to the sweet, dank smell of wet bar towels and stale beer. And after a few visits, we're happy to tell you that new J.G. Melon looks, feels, and tastes pretty much exactly like old J.G. Melon. So if this is a long overdue sequel, it's Herbie Fully Loaded. Cinema at its motherf*cking finest. The new J.G. Melon owners are so committed to authenticity, there's even a bartender named George who will introduce himself to you with a handshake when you sit down. He is either from Staten Island and actually named George, or he's an actor from Maryland named Trevor. Either way, we're into it. You will be too. Looks right, smells right, tastes right. Carry on. A little bit crispy, a little bit tender. These are also right on the money. Here's the scenario: It's Sunday, you spent your entire weekend drinking, and now you're having a burger. Maybe you should think about getting a salad into the mix. Or maybe you have no idea what we're talking about? Whatever you say. Those who truly know how to do J.G. Melon know that a side of chili is a must, if only to dip your cottage fries in. That thing we said about how you spent your weekend? Here's a salad alternative. If you really have some balls, order a Bloody Bull, which is this but with beef broth mixed in. Day Drinking Outdoor/Patio Situation Sports! A speakeasy-type restaurant in the West Village with heavier food and photos of authors on the walls.